A Mile-Long Post About My Week of Open Mics in Paris – But Some Real Discoveries! PARIS – I cannot believe that it has already been a week since I last posted about my escapades in open mics and jam sessions in Paris, and that I’ve done another pretty full slate of open mics in Paris again since that post! That was not the way this blog has gone for the now six years of its existence. I’m usually very timely in my writings about the open mics – a day or two maximum afterwards. But like I mentioned recently, I’m really hard at work, and very excited (that’s corporate-speak, but true!) about the progress of my open mic documentary, which, like my CD that I just got finished and made, will also be called, “Out of a Jam.” But now, on to a few notes about the last week…. I then headed over to the new open jam session on the Ile St. Louis, at the Chez Madame Louis bar. It turned out to be as lively and kicking hot as usual. I managed a couple of songs on stage with a bassist, drummer, lead player and me on my guitar. But what ended up being the highlight of the night for me was that on my way out of the joint, I found some people outside the front door to the bar, struck up conversations, and pretty soon one of the guys took out his guitar and started playing out there. In all, a couple of people ended up playing and singing. But in the end, the bar owner decided it was time to take pity on the neighbors, so the music had to stop. But it was a fun moment of the kind I love at open mics and jams – spontaneity. On Tuesday, I finally decided to see if I could show up on time for sign-up at the Café Oz open mic near Place Blanche. I ended up maybe 12 to 14 or so on the list! But it was just two songs each. Still, I calculated that would give me at least two hours before I got up. I then thought of going to the many other open mics along the line 2 of the metro on Tuesday nights, but ultimately I calculated that, Hey, I bet I could take the metro all the way across Paris down to the Bastille, and then walk over the open jam session at the Nul Bar Ailleurs and take part in that, and then return to the Café Oz and do my bit there. I was actually really kind of proud of myself when it turned out that I COULD do that. In fact, I was quite simply happy as anything because I thoroughly enjoyed my moment at the mic in the Nul Bar Ailleurs jam. It’s called, “Jam around the table,” because it has that kind of feel to it, and there are tables around it…. But it is very intimate, and extremely well organized. My only criticism would be that in between the main bits where you get to the mic, the jamming of the rapping and reggae kind can go on a long, long time, as it did Tuesday – but that’s only a criticism because I was so excited to get behind the mic again myself! In the end, I figured I better get off to Oz again…. And I did, and I played, and I had time for a beer before, and after. So it was the perfect night! Thursday, it was back to the Zebre Rouge open mic and another fabulous time in the cellar of this bar. In fact, I had to go and pick up my entirely re-fretted Seagull S6 in Pigalle before the Guitar Garage closed, so I was very early for the open mic. But I decided that I would try out the food at the Zebre Rouge, and man did I have a great African meal! And I managed to find a table in the back of the room very secluded, where there were about four or five places in the wall where I could charge my telephone and plug in my computer. So I spent an hour sitting there, drinking my dinner wine, eating, AND editing my documentary film. Can things get any better than this? Evidently, they can! For on Saturday night, I finally had the time and inclination to go and check out the jam at the bar called, Le Paradis, which is near the Barbès métro. I had seen this one for months, since there is little else on a Saturday night in Paris. And because it is usually run by the same guy who runs the Nul Bar Ailleurs jam. So I went to le Paradis, and found myself in Paradis! The bar is just the right size for a jam, i.e., small, with a back room where you can go to breathe, nevertheless. But best of all, the bar manager lets the music go on until nearly 2 AM or so, and it is loud, and it is drums, it is saxophones, it is guitars, basses and keyboards and vocals. But it IS a jam, and the audience is so big and crowded around the “stage” area that you are best off playing crowd pleasers of one kind or another and having the audience sing along. To my total surprise, I also met Stephen Saxo there, and so we managed to jam together. There is no doubt for me whatsoever that I will be returning to this fabulous jam, which I finally got to. In addition to everything else, I arrived and found the mic ready for me the instant I arrived, and in ripping off my coat, buying a beer and taking out my guitar in about one movement, I did not see it but I had dropped my expensive new cell phone on the floor by the bar. An hour later – after they had announced the discovery of the phone, and I had not heard them – they still had the phone behind the bar and when I was running around in a panic thinking I’d lost it, that it was stolen, there it was being kept in a safe place for me. “We’re serious in this establishment,” the manager said. I agreed, and thanked him profusely. I will definitely be back to the Paradis – it’s a paradise (for jammers, anyway). Where Was the Action? Tennessee, Galway or Coolin? 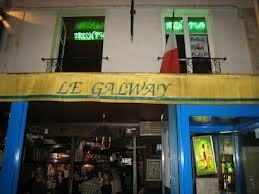 PARIS – I’ll start by saying that my little crawl through the open mics of the Latin Quarter last night began with putting my name on the list of the Galway Pub open mic. It then went from there to dropping by at the Tennessee Bar open mic; and finished cool at the Coolin. And which was the best, hands down??? The Tennessee, I must say, was the worst. This place has recently died. The Tennessee, for years run by James Iansiti, was one of the best open mics in Paris. And one of the things that made it that was the amazing location of the bar, and the fabulous basement layout, its amazing stage, the possibility to go to the ground level or outside to talk and smoke. Then James left the place (now at the Café Oz, Denfert), and the Tennessee went through some kind of transition period using several different MCs, and this has now led to its current state of disaster and death. 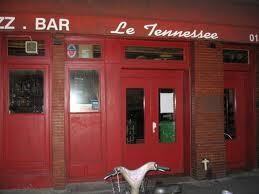 So if you want a really hideous night at an open mic in Paris on Mondays, drop by the Tennessee. Really, this fabulous bar and musical venue – potentially – must do something to save its current descent into hell. If it looks like I was drinking some good whiskey while writing the above paragraph, then that’s right. But maybe I had better say something more concrete: First, there is no longer any ambience, the MC seems nice enough, but that’s not enough. There were five musicians present, it was a jam session not an open mic (which can be great, but there was no sense of cohesion here), and it seems that all those kinds of people who used to flock to this place to have a sense of home and fun, have abandoned ship. The stage is there, climb aboard and do what you want. Each musician for his or herself. Next: So I spent only a few minutes there, grabbed a bit of video footage of some people playing – before THEY abandoned ship and turned up at the Galway – and I went to the Galway. The regular MC, All the Roads, Romain, was not there last night, and was being replaced. That meant an immediate downer, since Romain is so much a part of the vibe at the Galway now. The replacement was just fine, and is alway a regular musician at the Galway. But at least for as long as I stayed, I did not find the atmosphere I was looking for exactly, and I DID get to play early and therefore have the time to move on to the Coolin as I wanted. In the meantime, I learned a response to the question I had posed to myself the last time I visited the Galway: The two tickets that every musician who plays now receives (that I mentioned last time) are worth Happy Hour prices for the drinks. This is a fabulous innovation at the Coolin, and really shows how much the pub respects and encourages musicians. My Kilkenny cost me five euros instead of something like seven euros fifty or so. But I wanted to check out the Coolin in this last period of the pub’s existence. How horrible, the Coolin, after some 20 years, will be closing March after the market building in which it is based was bought out and kicking out all the businesses. It was a relatively quiet night at the Coolin in terms of the numbers of musicians present – as it had been at the two previous joints (thanks no doubt to the cold weather) so despite arriving late, I got my name on the list. Just check out the videos to get an idea of the fabulous atmosphere at the Coolin last night. And go every Monday until 16 March, the last night for the open mic – before the closing day of the bar with the final musical day of madness on the 21 March. Coolin wins hands down last night in the Latin Quarter. SINGAPORE – I’m kind of wiped out, having attended the Tennessee Bar open mic on Monday night in Paris, having it turn out to be an epic night, and then getting up early Tuesday to take two flights to Singapore, where I now write these words on what is the evening in Singapore and mid-day in Paris. But I just had to put up a post about that evening at the Tennessee, after I checked out my videos…. I had left my Zoom Q3 recording device at home and so I ended up having to use my iPhone 5S to record the open mic stuff. That’s great visually, but the sound would have been better on the Q3. No matter, though, a the sound at the Tennessee was so good, and the quality of the performances exceptional, that the videos are worth seeing AND hearing. First, let me note that the Tennessee open mic had a different feeling to it this week thanks to the replacement of the regular guy (a one off?) by Brislee Adams, who hosts the now very successful Café Oz open mic. It was Brislee’s usual deft touch. But what really made the night stand out was the number of exceptional acts. Oh, by the way, my own slot was a total disaster! For some reason my guitar – my Seagull S6 – ceased to work through the amp now and then particularly when I began moving in time with the music. So I was interrupted throughout by the bad connection, or, what I hope is the case, the need for a new battery. I’ll find out now in Singapore…. But the result of the cutting guitar was that I started to sing my first song, the French, “Et dans 150 ans,” which I had perfectly performed in three open mics recently, only to go blank on the lyrics after just one verse. I had to bail out, and just made a complete mess of it, and quit. Then I did my new song, “Chanson d’amour,” and the guitar apparently did not like that one either, and kept cutting out, and I forgot one or two lines. And the same thing happened with “Borderline,” in terms of the guitar, although I did not forget the lines. But I was totally, totally outside the song. Worst set I’ve done in ages. So Theo and Louise came down and did three songs, including the Elvis Presley one that I’ve put up on the blog. It was part of a finale to the evening that was extremely powerful, thanks also to the man who had just preceded Theo and Louise, that is Desmond Myers. Desmond, with a great little Martin parlour guitar that someone lent him, and with his amazing mix of rap and roll…. Well, anyway, just check out the videos. PARIS – I have no idea how this happened, but somehow, another week has passed, and it turns out that I have once again just done three open mics in two nights, though not the same two nights as last week – this time it was Monday and Tuesday. So this time, I repeated only one of the three open mics as last week. I returned to the Galway pub earlier this time than last time, and I managed to get my name on the list! That’s not to say there were not a lot of people – it was still a huge list. It was just the fact of getting there earlier that saved me. But since I was still 9th only the list, and the open mic had not started yet, I decided to go around the corner to the Tennessee bar again, and there I found a new experience! Yes, six years attending the Tennessee Bar open mic, and it was the first time I had seen the open mic take place on the ground floor and not in the basement. So that was really cool. It was the new MC, and he played a few songs, had someone play along with him at one point, and then it was my turn. Part of the reason I wanted to do three open mics in a row this week, though, had was because I wanted to try singing a song in French for the first time – I’d failed last week – and I also wanted to try out my new song. This time, at the Tennessee, I made three false starts on the French song, and then finally got through it from beginning to end. This was thanks much to the bulk of the audience being in talk mode, and so I said to myself, “OK, no one is listening, so I can sing this as if I’m in my living room.” It worked. The French song is “Et Dans 150 Ans,” by Raphael. My new song is called, “Chanson d’amour,” and it too contains some French…. I went on from the Tennessee to the Galway and again managed to repeat sing both songs, and got through both with no problem. My own song went down better at the Galway, since here a lot of people were listening, and they clapped along with the rhythm. I felt great! And it was a fabulous open mic, with the birthday celebration of the MC, Romain. Last night, it was off to Brislee Adam’s Café Oz open mic again, near Pigalle, by the Blanche Metro. This is the one I did last week as well. But last night was an even better night than last week. The evening was full of amazingly interesting performers, as you will see in the videos I made. And I managed to get through the French song even better than on the night before, so objective achieved. But I did not feel like I wanted to sing my new song, and instead did an older one of mine. PARIS – As with my report from the Highlander open mic last week, I made a visit to play music at the Tennessee Bar open mic the other day for the first time in many months. But unlike at the Highlander, the Tennessee does not have the same long-standing MC running the show, but has gone through a few changes in the last year. The first thing that happened was that the longtime MC and Tennessee bar open mic organizer, James Iansiti, left the job after something like six or seven years running the thing. He was immediately replaced by Yaco, the organizer and MC of the Petit Bonheur la Chance/La Tireuse open mic, which was one of the best in Paris. Yaco went on to run the Tireuse on Tuesdays and the Tennessee on Mondays and Thursdays. That was a lot of Yaco, and for reasons I have not found out, he left the Tennessee job and the Tireuse ceased to exist as an open mic. That brings us to today. I didn’t catch the name of the new MC and like every good journalist, I didn’t bother asking him his name. Some day I will, no doubt! But he was doing a pretty good job – except for the occasional mystery disappearance – and it is safe to say by this one experience that the Tennessee Bar open mic seems to have reborn, somehow, into something similar but different. But then, up the street from the Tennessee the Galway was overflowing with musicians…. I had the feeling it was a younger crowd, and I had the feeling that the new MC is a hands-on guy, playing with other musicians on guitar and percussion when they want. He makes a list, and basically gives musicians more than just three or four songs if it feels like they are being well-received – he asked the crowd a few times if they wanted more from musicians…. All good so far. The Tennessee may have found its way into a new territory. Having said that, I really only ended up at the Tennessee because the Galway – near by on the Quai des Grands Augustins – was overflowing with musicians and I’d be about No. 25 on the list despite not really being that late to sign up. So, keep an eye on these two Monday night open mics in Paris and let’s see where they go….